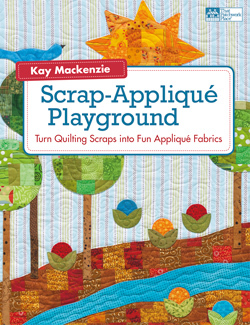 At the recent Glendale guild show, a quilter told me that she had made one of the projects from Scrap-Appliqué Playground. 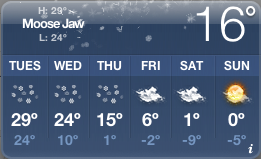 I’m always thrilled to learn these things! My version of Studio. 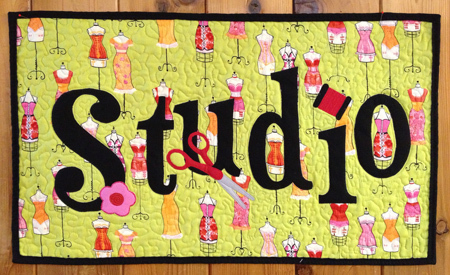 You can make any sewing room or nook into a studio if you hang up a sign! I love it! Very Project Runway, don’t you think? I’d call it a giant step. Thanks for the Show & Tell Marilyn! 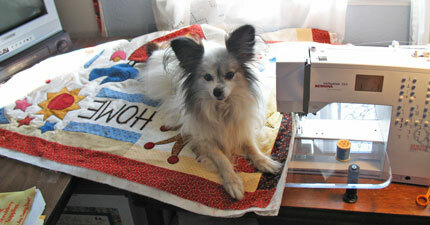 One of the most amazing women I know is fellow Santa Cruz quilter and fabric designer ellen edith. 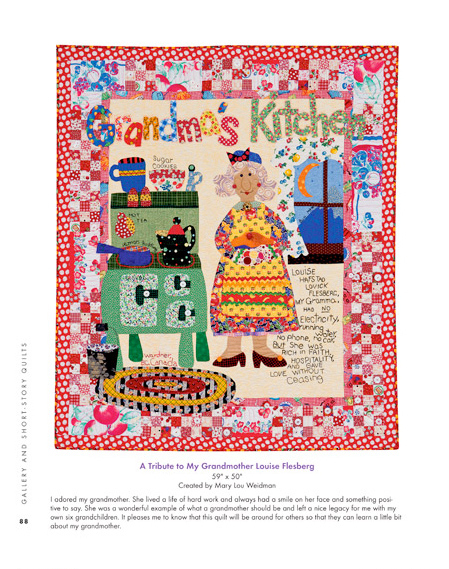 She makes story quilts about the many wacky and also meaningful things that have happened in her life. 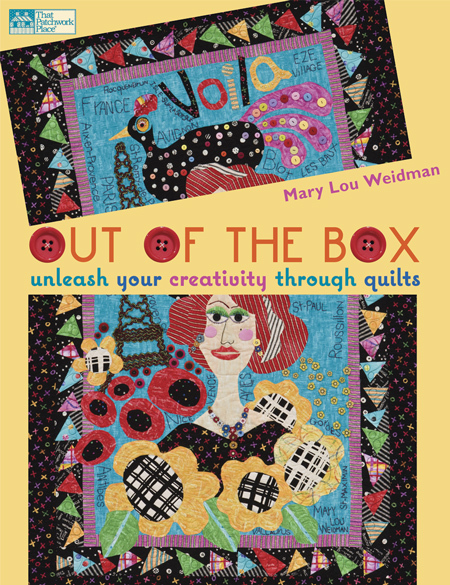 These quilts are so full of color, life, verve, and a million other energetic words. It’s a style I greatly admire. 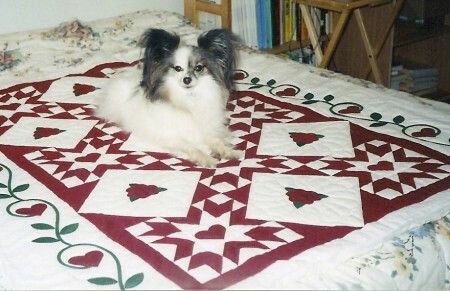 Recently ellen sent out photos of her latest quilt, First Date. My first date with Larry was bicycling to the monarch butterfly preserve. He was so cute & I was so nervous I was yacking away. He finally said “If you would lie down & be quiet the butterflies might land on you!” Right then I knew I could relax & be myself around him. We have had 15 wonderful years. I used some of my own butterfly fabric, dressed myself in bright colors & added a vintage pin as a hair ornament. Santa Cruz is in the migratory path of the Monarch Butterfly. Each fall we look forward to their visit. I can just picture this lovely scene at Natural Bridges State Park. 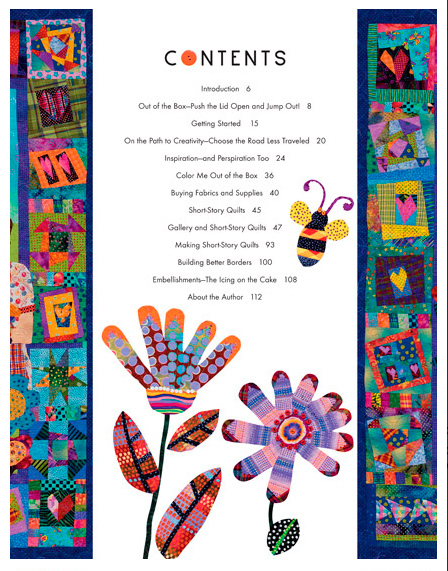 The ABCs of Words on Quilts, Pamela Humphries, author of Award-Winning Appliqué Birds, and Ricky Tims, author of Rhapsody Quilts. Within each interview there’s always a question or two about the designers’ techniques, which I’ve found truly illuminating in each case. 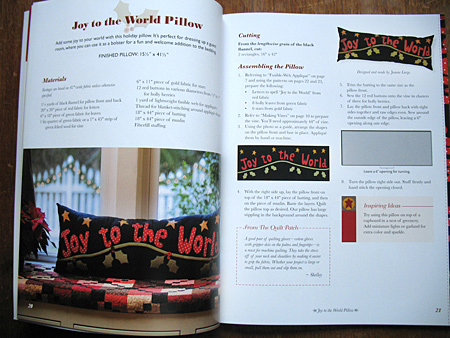 There are free patterns, as I said in many cases lovingly hand-drawn, features on specific topics in appliqué, product reviews, etc. In three issues I’ve picked up at least six tips! I’ll share just one of them, to give you an example. Member Jan Walter from central Illinois contributed a darling Santa pattern, and gives advice about the white beard and mustache: “For iron-on appliqué, back your whites by ironing a medium-weight interfacing on the back before ironing on the fusible web.” Thank you, Jan! We’ve all struggled with what do do about shadow-through with white appliqué pieces. TAS has many noted professional members among its midst, who do a lot to support the organization by contributing patterns and articles. 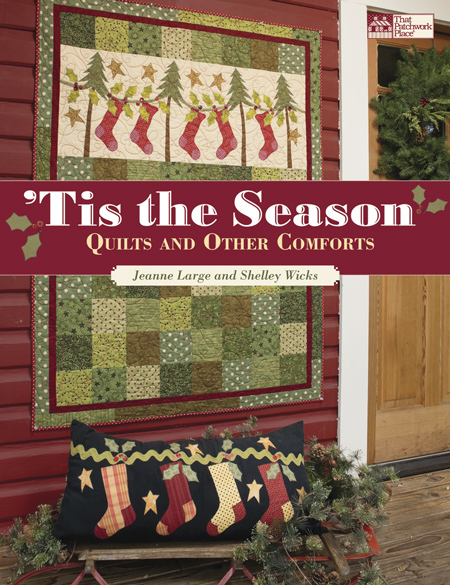 TAS membership also gives you the opportunity to join or start a local chapter, and stitch with like-minded quilters. You might enjoy belonging to the Society as well. Visit the TAS website. My little dog Willie loves to go places, and loves to come back. He’s a good traveler, but I think he’s the very happiest when all of his pack are at home. As you know, he helps me in the studio and is my boon companion while I’m working on all of my “stuff.” Here he is checking out my latest project, Home. Yes, that’s right, the ink was hardly dry on Teapots 2 to Appliqué when I was already hard at work on another quilt design. I’ve been in a phase of doing things I haven’t done before, and it’s great! Home is more primitive and folksy than what I’ve done before, and I love it. I knew the word “Home” would be front and center, and didn’t worry about how I was going to get it on there until I was ready to do it. 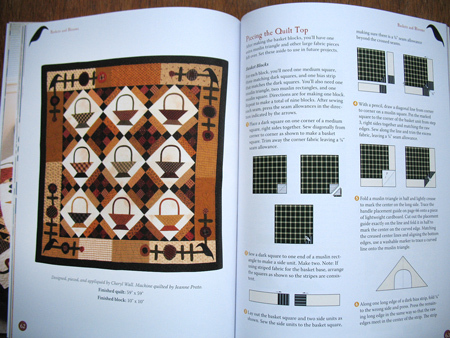 After all, I co-wrote an article about words in quilts, which appeared in American Quilter. I knew I had some tricks up my sleeve! But when it came to it, I ended up doing… guess what… something I hadn’t done before. Okay, so I’ve made plenty of bias tape in my life with my trusty green gadget (see the post on stems and skinny stems) but I’ve usually stitched both sides, either by hand or machine. This time I just zig-zagged down the center of each strip with black thread. Then I made a trip to the store to get some fresh Fray Chek (the bottle in my drawer was ancient, probably came with me from Ohio 11 years ago). I used a tiny bit of this seam sealant on the raw ends of the letters to prevent fraying. I ended up with the folksy look I was after for this project. Home‘s going to be a booklet with full-size patterns printed in it. Stay tuned! 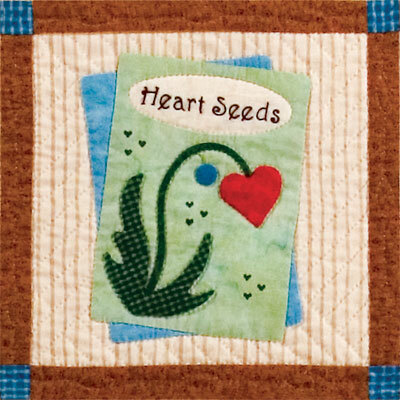 Here’s another block from Growing Hearts to Appliqué. A fun one, yes? When brainstorming on a theme,”growing hearts” or whatever, it’s so wonderful to let your imagination roam free and think up all sorts of notions about how to portray your ideas. 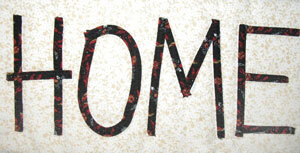 For this crazy design, I used freezer-paper templates on top, and I hand-embroidered the letters. The little black heart seeds are inked on with a permanent fabric marker. And don’t faint, but maybe you can see that this quilt is hand-quilted. It still happens now and again. 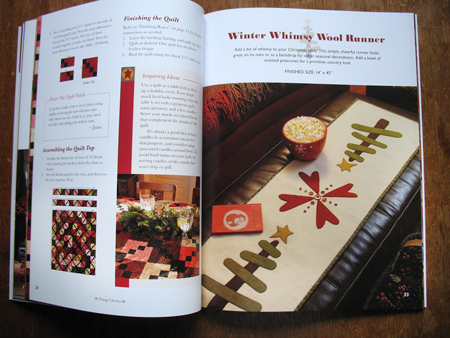 I conspired with my friend ellen edith on an article in the latest issue of American Quilter Magazine (Projects 2007). 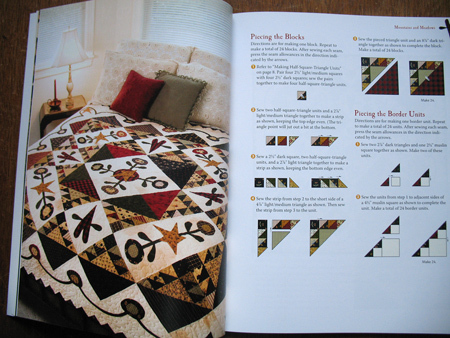 I called the article “Ways With Words.” It ended up being “The Write Stuff: Ways With Words.” As you might be able to tell, the article talks about several different ways of including words in quilts. Appliqué is of course a natural choice. 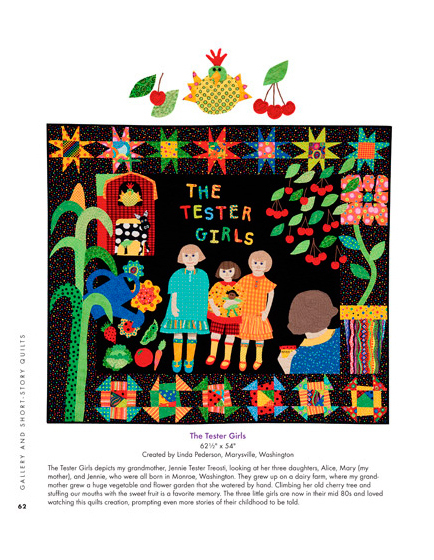 For the article, I made a little quilt called “Time 4 Tea.” It’s 24″x 18″, and in the magazine is living large on about a half a page! 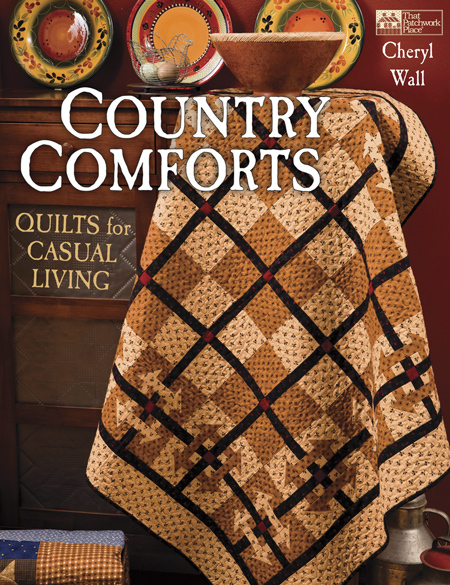 The letters, the large curly 4, the clock frame, and the teapot are fused and machine blanket-stitched. The clockface numerals are inked on with a permanent fabric pen. Over at the Quilt Puppy Show & Tell Center, there’s a beautiful quilt (also tea-themed) with words on it that were exquisitely hand-appliquéd by Cheryl Booton. Go see Tea Time For Good Friends.